Dell has teased us with ads for its new Adamo brand for some time now, with the first high-spec superslim laptop in the new series finally breaking cover this week. "Style-minded people who place a premium on precision craftsmanship and design can now add Adamo to their list of must-have items for 2009," reads the press release. 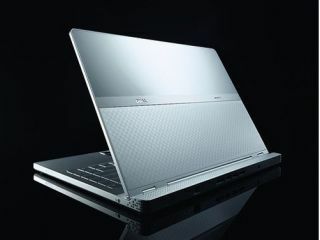 "Dell today unveiled the world's thinnest laptop as a kick off to the new Adamo by Dell brand." Fans of branding guff might even be interested to hear that the name Adamo apparently derives from a Latin word meaning "to fall in love," with Dell pitching this first machine as "a flagship in a line of products created to disrupt the personal computing space with the combination of new design aesthetics, personalization choices and sought-after technologies." The Dell Adamo is 0.65-inches thin, but at 4 pounds it weighs in a tad heavier than its competition the MacBook Air (3 pounds) and the Voodoo Envy (3.4 pounds). Still, it is not going to break your back if you are looking for a high-powered laptop to cart around with you every day. Plus, the specs and pricing may well lead to many consumers overlooking the Adamo's slight weight disadvantage over the Air and Envy. The Core 2 Duo powered Adamo packs in a 13.4-inch 720p, 16:9 screen, 2-gigabytes of RAM (upgradeable to 4GB), 802.11n Wi-Fi, Bluetooth 2.1, with Dell claiming a 'five hours plus' battery life. The usual outputs are all in place - 2 USB ports+USB/eSATA combo port, HDMI, VGA and DVI with optional cables. The laptop runs on the Intel Mobile 965 Express chipset, making use of GMX4500 integrated graphics for its visual juice. US pricing is a couple of cents shy of $2000 for the basic configuration, with the first units set to appear on Thursday March 26. Stay tuned for UK pricing and release details as and when we get them.